Heat oven to 450°F. Remove pie crusts from pouches; unroll on work surface. Cut six 4 3/4-inch rounds from each crust. Firmly press 1 round in bottom and up the sides of each of 12 nonstick jumbo muffin cups. Bake 5 minutes. Reduce oven temperature to 350°F. Make cake batter as directed on box. 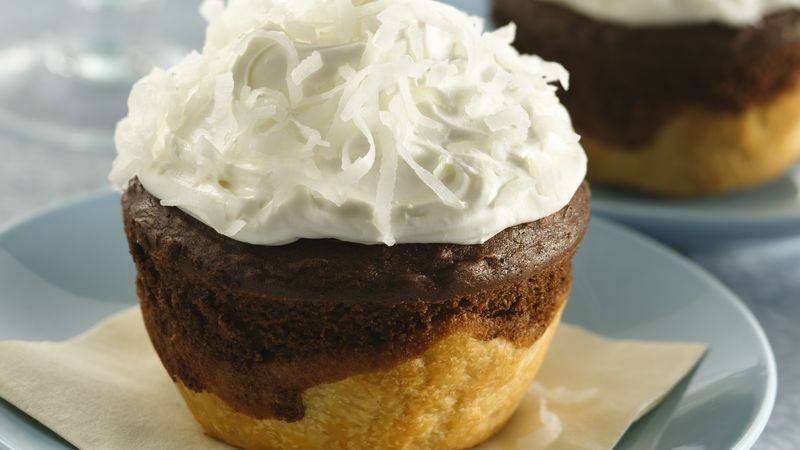 Place 1 tablespoon chocolate chips and 1 teaspoon coconut in each pastry-lined muffin cup. Top with cake batter, dividing evenly among muffin cups. Bake 30 to 33 minutes or until toothpick inserted in center of cake comes out clean. Cool completely. Frost with frosting. Top each with 1 teaspoon coconut.